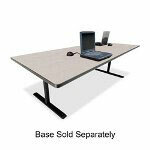 Racetrack tabletop is designed for use with Bretford Basic Rectangular Conference Table components. Laminate top features a 3mm T-mold edge and two grommet holes with covers for cord management. Tabletop is made of 1" thick particleboard finished in laminate. 18-gauge metal stiffener under the work surface provides extra strength for table use. Base is sold separately. Tables meet or exceed ANSI/BIFMA safety and quality standards. Freight Delivery: $102.39 - for 1st unit. Due to the size, shape and/or weight, this item will ship via a common carrier or freight service, incurring freight delivery fee. Please allow 3-10 business days for freight deliveries. *Each additional unit is charged a percentage increase to the original freight delivery fee, not the full amount.